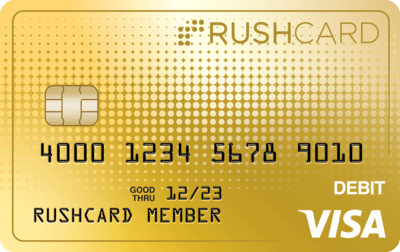 How can I fund my Prepaid Visa RushCard? You may easily fund your account using Direct Deposit or by loading cash or checks via approved methods. Click here to learn more. Certain fees may apply, including those charged by the third-party load partner. To learn more about funding your account with MoneyPak®, visit MoneyPak.com. Watch our Set up Direct Deposit video to learn more. Watch our Fund Account with MoneyPak video to learn more. Watch our Fund Account with Reload @ the Register video to learn more. Watch our Fund Account with MoneyGram video to learn more. Watch our Fund Account with Western Union video to learn more. Watch our Fund Account with Ingo video to learn more. Can I send money from my bank account to a RushCard? If your bank offers ACH transfers from your checking or savings account, you can transfer funds to your RushCard. If not, you can link your bank account to your PayPal account and transfer funds from PayPal directly to the RushCard. Can I transfer money between RushCards? Yes. With RushCard's Card-to-Card Transfer you can send money to anyone who also has a RushCard, or you can transfer money between your own personal RushCards. You can transfer money instantly or schedule a transfer for a future date. There is no fee for transferring money between your own personal RushCards. Transferring money to another RushCardholder costs $0.99 per transfer. What information will I need to provide to transfer money? To protect your online account and your money, we require that you provide your CVV# (the three-digit code found on the back of your card) before completing a transfer. Are there limits on how much money I can add, transfer or receive? Please refer to the Cardholder Agreement for additional information on limits by all load types. Limits: $2,999 total per day for cash loads; $2,000 total per 24 hour period, and $5,000 total per rolling 30 days for Card-to-Card transfers; $10,000 per transaction for ACH/Direct Deposit. Can I deposit a check online by taking a picture with my mobile phone? Can I do a Card-to-Card transfer or receive a Card-to-Card transfer when I pause my card? You will not be able to send or receive money through Card-to-Card transfer when your card is paused. Once you resume your card, you will be able to send and receive Card-to-Card transfers.